We’re talking with Manos Phoundoulakis, founder of Hot Caliber Jewelry and master inventor behind the flattened bullet jewelry concept. Well, actually, when you dig a little deeper into the story, most of the credit for the idea goes to his partner and bride Kelle. Isn’t that the way it always is? 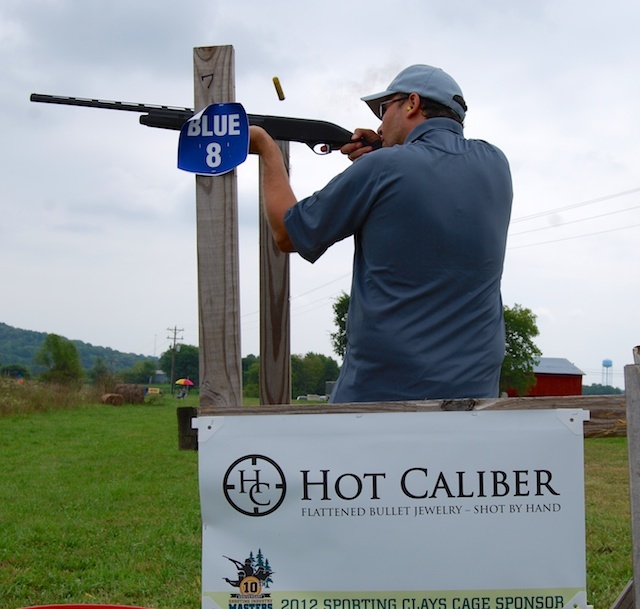 While shooting with Team Hot Caliber at the 2012 Shooting Industry Masters event, we were able to pick Manos’ brain about being ‘hawt’ with Hot Caliber jewelry. As a side note, the Masters event served as the launch for the custom edition benefitting USA Shooting. My Gun Culture: Right off the bat, I need to clarify an important question. Do you need to actually be ‘hawt’ to wear Hot Caliber flattened bullet jewelry? Or do you have to at least perceive yourself as ‘hawt’ to wear this stuff? Manos Phoundoulakis: No, actually that’s what’s great about Hot Caliber. If you’re not hot, and you wear Hot Caliber, you will become hot. We guarantee it! Be careful of not wearing your Hot Caliber jewelry though, you can lose your newly found hotness. MGC: I understand you put together a special benefit program for USA Shooting. Can you tell us about that? Manos: Earlier this year at the NRA Annual Meeting, we decided to put together a benefit program around the Shooting Industry Masters event. The FMG Publications (editors note: American Handgunner, Guns Magazine, and American Cop Magazine) folks came up with the idea to benefit USA Shooting and right off the bat it was clear to me this was a great idea. You see, I’m Greek. The Olympics started in Greece. They weren’t shooting back then, but they were throwing stuff, and that counts for something. We didn’t invent the gun, but we do take credit for shot put. MGC: So without divulging too many trade secrets, how do you make Hot Caliber flattened bullet jewelry? Manos: After more than 4,000 rounds of testing, we now know what it’s going to take to create a perfect flattened bullet. Normally, we shoot 100 rounds of a specific ammo type, depending on the type and size of piece we want to make, at a big heavy piece of steel. Over time, I’ve figured out what exact brand and load will produce perfect flattened bullets of a given size. Then I get to sift through the dirt and retrieve the flattened bullets. At this point, I pick the three best and run them by a small committee to help identify the best overall bullet impression. MGC: So people have to be small to be on the committee? Manos: No, but they do have to have really good eyesight. The committee is small in number, not in size! At this point, I take the flattened bullet and mold it in a rubber molding compound. From there we cast the initial model. If it’s our general Hot Caliber product, that model gets cast in silver or gold, then it gets put into the jewelry. We use a lost wax casting method. I won’t bore you with the details, but there are many important steps involved in creating a piece of silver or gold jewelry with this technique. I’ll go ahead and claim that the Greeks invented the lost wax technique also – even though that probably isn’t true. Sometimes we use an oxidation technique to help bring out the visual texture. For the Masters Edition, we have to take one more molding process to engrave one or both sides, depending on the piece. 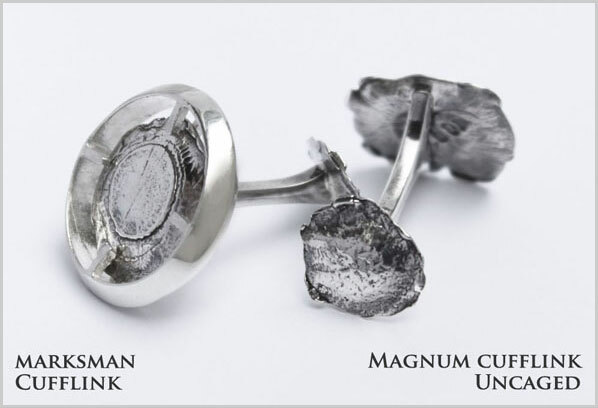 MGC: Since you use actual bullets to come up with these designs, when did Mayor Bloomberg contact you about outlawing Hot Caliber Jewelry in New York City? Manos: Well I don’t know him personally. And quite frankly, he’s not very attractive, but he would be much more attractive if he were to be wearing Hot Caliber jewelry. Then he might lighten up a bit. Hot Caliber offers a variety of flattened bullet jewelry for men and women – pendants, rings, cufflinks, keychains, and more. MGC: Hot Caliber jewelry is already pretty elegant stuff, but do you have plans to enter the “Lifestyles of the Rich and Famous” market? Maybe something Paris Hilton would wear? Manos: Just between us, we’re thinking about a “Haute Calibre” line. But that’s secret. MGC: If other organizations or companies want to create special Hot Caliber editions to sell or fundraise is there any way they could do that? Manos: We do offer special editions and licensed manufacturing for sale on other websites/catalogs. I would personally love to make an edition for any of the US Armed forces, or a Soldiers Angels Edition…anything that could help support the people that risk their lives for our freedoms. I’d make a Nancy Pelosi edition, but she would probably use the money to take my guns away. Be sure to check out the Hot Caliber collection at www.hotcaliber.com. 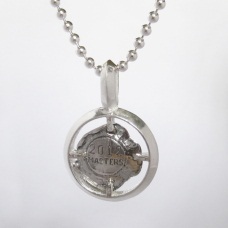 Better yet, order a special edition piece to support USA Shooting!